Product prices and availability are accurate as of 2019-04-17 00:41:46 EDT and are subject to change. Any price and availability information displayed on http://www.amazon.com/ at the time of purchase will apply to the purchase of this product. In a class of its own! Grind, tamp, brew and clean in under 60 seconds¿with a push of a button. Make perfect espressos, cappuccinos, lattes and crema coffee..every time. The Impressa S9 Avantgarde is one of the fastest and most versatile Automatic Coffee and Espresso Centers on the market today. 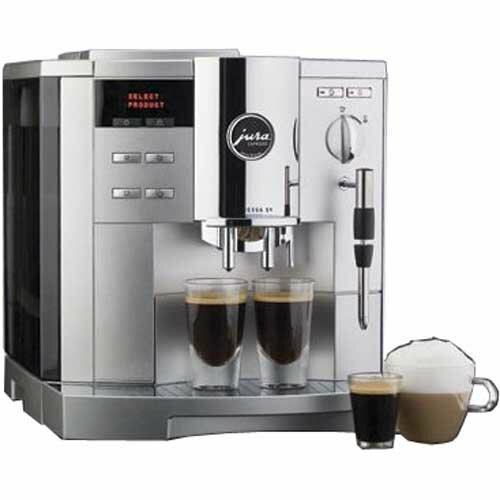 With its 96-ounce capacity, two stainless steel lined thermoblock heating systems, a traditional frother and the automatic frothXpress Plus system it produces coffees, espressos and unlimited amounts of hot frothed and steamed milk for cappuccinos and lattes with no down time. Four pre-set beverage buttons and a unique "a la carte" button give you endless possibilities of creating your own coffee fantasies. A separate hot water spout for tea, a separate ground coffee funnel and a stainless steel warming tray on top make this a complete hot beverage center. With its UL listing for household and commercial use the S9 Avantgarde is the right machine for home, office and any small restaurant. Commercial solid steel conical burr grinder with 6 fineness settings for any type bean and low noise construction Two stainless steel lined thermoblock heating systems are always ready for coffee and steam with no downtime, no contact with aluminum. Four one-touch individually programmable beverage buttons, all with unique rotary dial to override for temperature, strength and cup size while brewing. 96-ounce removable water container with Clearyl water care system making decalcifying virtually obsolete. With the automatic frothXpress Plus system chilled milk is siphoned, heated, frothed and dispensed cup after cup. A latte setting produces hot steamed milk without froth.